Evolution Motorsports Carbon Fiber Side Mirrors PORSCHE - Dezod Motorsports Inc - Home of the automotive performance enthusiast since 2002. Evolution Motorsports Carbon Fiber Side Mirrors are direct replacements for OEM mirror housings. 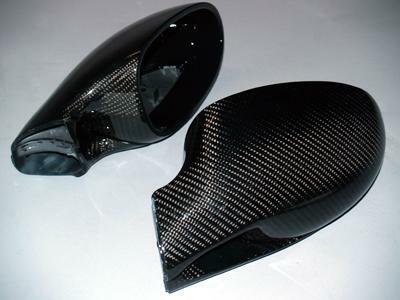 Evolution Motorsports Carbon Fiber Side Mirrors are made from OEM components which require no cutting, drilling, or fabricating. They install as a complete unit in place of the OEM housing. The OEM mirror glass and internal mechanism from your car get reused.